Between 1907 and 1930, Edward Curtis completed his 20 volume series of photographs and ethnographic descriptions, The North American Indian. Initially, this monumental project garnered a lot of national attention and the support of such men as Theodore Roosevelt and J.P. Morgan. However, as the work went on well past the initial 5-year estimate, much of this initial attention and support faded. It was not until the 1970s that Curtis's work was rediscovered and once again became a major subject of scholarship. This site will examine this trajectory, from Curtis's developing interest in the project, to the ways that he promoted it at the height of its popularity, to the falling off of interest in the late teens and 1920s. Becoming Edward Curtis explores how Curtis developed his idea for The North American Indian by looking at his studio photography and early photographs of American Indians, and the role that his participation in the Harriman Expedition and his meeting Roosevelt and Morgan played in beginning the project. 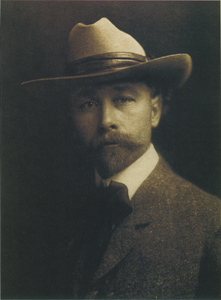 Promoting Edward Curtis provides many of the materials, such as brochures, advertisements, magazine articles, lectures and music, books, and motion pictures, that Curtis used to promote and gain support for his project. The Vanishing Edward Curtis discusses the reasons for a falling off of interest in Curtis's project during World War I and the 1930s, and looks at Curtis's career after the completion of the North American Indian.